World Record Dolly Varden -- 18 lbs. 9 oz. 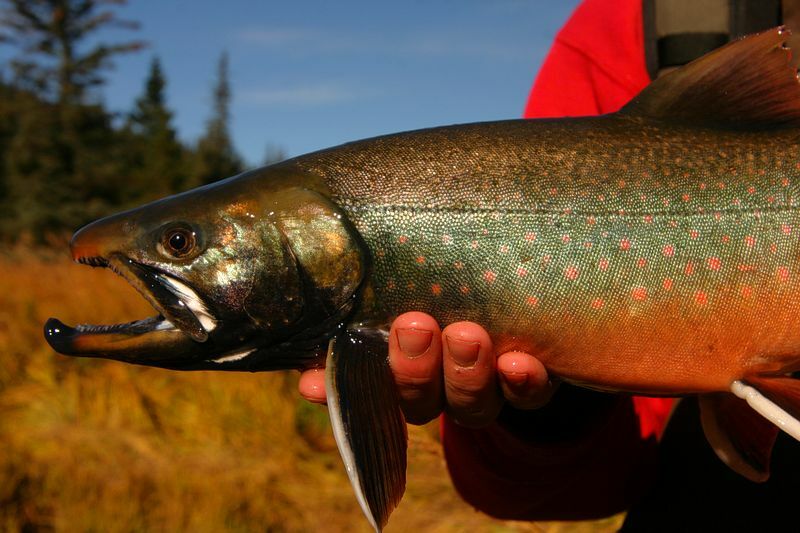 This species of spotted trout has a scientific name of Salvelinus malma. 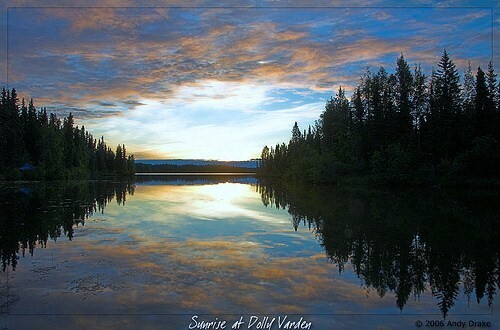 Dolly Vardens (not Dolly Parton) call fresh waterways of the northwest United States home. Home waters are bright and clear with an average temperature of about 55 degrees Fahrenheit and can be caught year round. Dollies spawn from August through November, so they like the fall foliage. Sexual maturity is reached between 1 and 3 years of age with an average size of 12 to 18 inches for non- migratory species and 18 to 24 inches for migratory Dollies. The eggs hatch 4 to 5 months after fertilization, so they spawn in the fall and then rush to the delivery room in the spring. Dolly Varden trout can live as long as 10 to 12 years. Most trout are carnivorous. 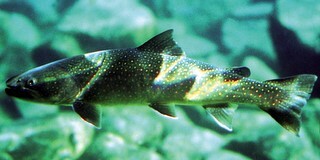 Dolly Varden trout are piscivores and the diet consists of other fish, fish eggs, spineless aquatics and insects. Dollies are another opportunity eater and will take whatever is floating by on the current. You can catch your lunch right after your breakfast, then catch dinner just in time for the campfire. Trout basically have a taste of their own. White, fluffy meat with a light, fresh semi-sweet taste naturally. These can be filled with cornbread stuffing and baked, filleted and fried or broiled with butter and your favorite seasoning. I prefer garlic and a little pepper. White wine (to cook it in) is nice but not altogether necessary. Even rolled in balls, breaded and fried, is a treat I have had on several occasions. The name “Dolly Varden” comes from two different sources, one being a novel by Charles Dickens that has a character by that name. The second comes from a type of dress popular in the 1870’s. There was a fashion trend that used a sheer dress worn over a bright garment beneath. This fashion was called the Dolly Varden and was reportedly suggested by a woman who happened upon a group of anglers who were admiring a large calico trout they had landed. They wanted to give it a better name and the lady said “Dolly Varden” because it reminded her of her new dress. The name stuck. Like most trout, the Dolly has migratory and a non-migratory (anadromous) subspecies. The non-migratory Dollies have a green to grey back that shades to a white belly. There are usually pale yellow or pinkish-yellow spots on the body and the fins are unmarked. 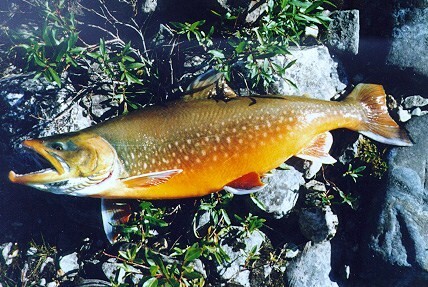 Dolly Varden differ from their cousins in their bodily coloring. Rainbow trout have a broad red band down the sides and their sea-going brethren, the Steelhead are a metallic grey. The cutthroat trout has a dark back, white belly and is distinguished by a coloring under the chin (if you can CALL it a chin). Dollies also will spend their entire existence in water that ranges from 50 to 55 degrees all year round. Rainbows and cutthroats need a colder temperature around 12 degrees Celsius. Please remember, if you're not going to eat 'em, then kindly CATCH & RELEASE 'em! !